In a closed flock where the total number of breeding ewes is relatively small, it is important that some planning is used in breeding strategies to limit in-breeding. The breed in North America goes back to a small number of imported animals, which gives a further reason for care in preserving lines and families. The system we use at Homebank Farm may be of interest to breeders. We run five breeding groups (A-E). This is a minimum number for this system. We originally made up each group by putting all related ewes together. With 50 ewes this gave us around 10 ewes per group. 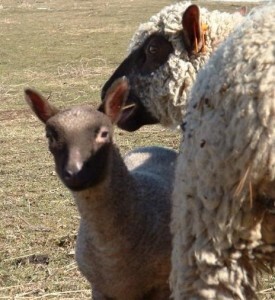 We allocated an unrelatedMother & Lamb by Dawn Kundert ram to each group ­ and he breeds those ewes each year. 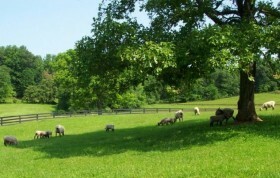 When ewe lambs are kept for replacements, they move to the group two back (i.e., from C to A, D to B, etc.). Replacement ram lambs go one group forward (i.e., from A to B, from B to C, etc.). Ewe lambs must go back two groups because their sires will have come from the group one back. Against the geneticists’ advice of changing generations often, we try to use our sires for five or six years, and by doing so, a closed flock can limit inbreeding for many years. We also try to replace rams for all groups the same year. We have found that by running a closed flock, except for importations from the U.K. with long quarantine periods, we can maintain excellent health in our animals. If anyone has questions or comments, please feel free to contact me.